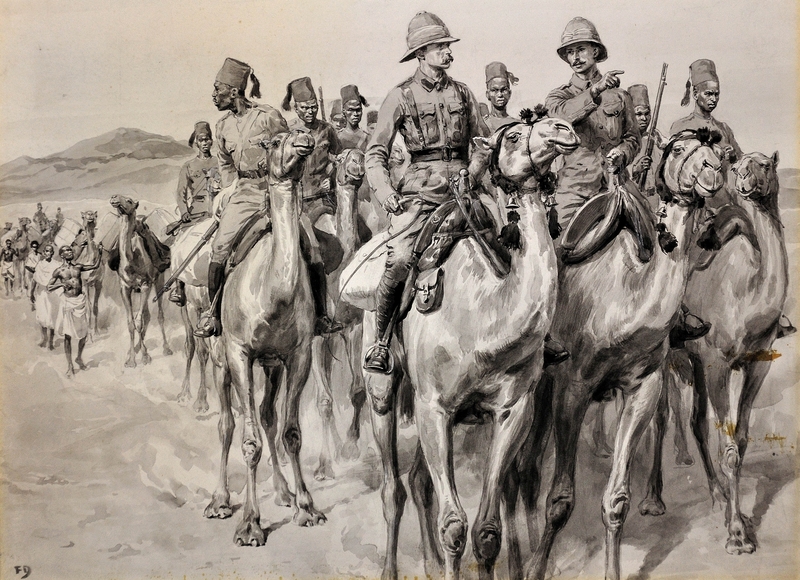 Frank Dadd - British Army Camel Corps, Sudan - Online gallery supplying original fine art. Trending Modern British and Contemporary Welsh. Available for sale from Big Sky Fine Art; this original monochrome painting by Frank Dadd; dating from the middle 1880s.<br> The work is presented and supplied in a sympathetic contemporary frame, mounted using conservation materials and behind non-reflective museum glass. <br> The watercolour is signed with a monogram lower left.<br> <br> Known best as a black and white artist and a figure illustrator, Frank Dadd was born in Whitechapel, London on 28th March 1851. He was the son of Robert Dadd, and the third of six children. His father’s brother, Richard Dadd, was also an artist, but infamous for murdering his father and spending the rest of his life in Bethlem (Bedlam), and then Broadmoor, painting works which are now highly esteemed and extremely expensive. <br> <br> As a child Frank spent his holidays around the dockyard of his maternal grandfather, who was a well known shipbuilder. The knowledge he acquired here was put to good use in later years when he later painted river and coastal scenes. Always a keen drawer, from a young age Frank sought to capture historical events through art. He was taken to see the great Tooley Street fire at the age of just ten, and made a sketch of it accordingly. <br> <br> Frank Dadd was educated privately and went on to study at the Royal Academy Schools and the Royal College of Art, where he won a Silver Medal for his drawing from life. He became an accomplished artist and sold some of his drawings whilst he was still at the Academy Schools. On leaving education, through family connections he secured a position with the London Illustrated News and spent several years working there. At a time when the public learnt about world events largely through newspaper illustrations this was an important role. He later moved on to work at The Graphic, where he was also under pressure to work to deadlines. For instance, he completed a two page drawing of the Jubilee Procession outside St. Paul’s in a single day, and a four page drawing of the Battle of Omdurman was completed in two days, both representing very significant tasks which required staying up all night. Dadd began producing black and white works from around 1882. His equestrian and military scenes were considered particularly good. Dadd also worked for a number of magazines, including The Quiver, particularly for boys’ adventure stories.<br> <br> Dadd was elected as a member of the Royal Institute in 1884 and of the Royal Institute of Oil Painters in 1888. His works were exhibited at the Royal Academy occasionally from 1872 onwards, and also at Suffolk Street and the New Watercolour Society. He is also known to have exhibited works at the Franco-British Exhibition, which was held in London in 1908 and also in Philadelphia, Australia and New Zealand. <br> <br> Dadd’s style is very photogenic with heavy application of body colour and clever uses of grey wash. He was technically excellent and very accurate in detail. His pictures have been described as models of Edwardian eloquence.<br> His output was prolific; between 1880 and 1900 he completed an average of one hundred black and white drawings per year, illustrated a number of books and submitted works for exhibitions.<br> <br> Frank Dadd married one Jessie Herbert and had two sons and one daughter. <br> In 1903 they moved to Wallington, Surrey. Dadd renamed the large house Morwenstow and they lived there for sixteen years, with Dadd working from a large studio within the home. Dadd’s reputation was secured in 1908 when one of his paintings, called Gold Lace has a Charm for the Fair, was bought by Chantry Bequest for £100. This painting is now held by the Tate. He continued to be a commercially successful artist and his works commanded high prices.<br> <br> Dadd was an enthusiastic collector of military arms and armour, costume and old furniture, which no doubts accounts for the historical accuracy of his work.<br> He was an outdoor man and enjoyed walking in the countryside with his dogs.<br> Frank and Jessie, who enjoyed a happy marriage, moved to Teignmouth in Devon in 1919, and he continued to paint right up until his sudden death on 7th March 1929. 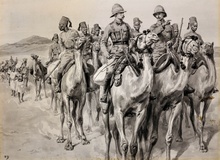 His obituary, in the Teignmouth Post the following day described his work as having “a pleasing freshness and delicately sensitive handling of colour value that delight the eye”.<br> <br> This is a landscape of the Sudan desert, depicting uniformed British army officers as part of a camel train with sand dunes in the background. The British Desert Column were active in the area throughout the late nineteenth century and are associated with Major Charles George Gordon, (also known as Chinese Gordon, Gordon Pasha, and Gordon of Khartoum) who was the Governor-General of Sudan for much of this era. Available for sale from Big Sky Fine Art; this original monochrome painting by Frank Dadd; dating from the middle 1880s. The work is presented and supplied in a sympathetic contemporary frame, mounted using conservation materials and behind non-reflective museum glass. The watercolour is signed with a monogram lower left. Known best as a black and white artist and a figure illustrator, Frank Dadd was born in Whitechapel, London on 28th March 1851. He was the son of Robert Dadd, and the third of six children. His father’s brother, Richard Dadd, was also an artist, but infamous for murdering his father and spending the rest of his life in Bethlem (Bedlam), and then Broadmoor, painting works which are now highly esteemed and extremely expensive. As a child Frank spent his holidays around the dockyard of his maternal grandfather, who was a well known shipbuilder. The knowledge he acquired here was put to good use in later years when he later painted river and coastal scenes. Always a keen drawer, from a young age Frank sought to capture historical events through art. He was taken to see the great Tooley Street fire at the age of just ten, and made a sketch of it accordingly. Frank Dadd was educated privately and went on to study at the Royal Academy Schools and the Royal College of Art, where he won a Silver Medal for his drawing from life. He became an accomplished artist and sold some of his drawings whilst he was still at the Academy Schools. On leaving education, through family connections he secured a position with the London Illustrated News and spent several years working there. At a time when the public learnt about world events largely through newspaper illustrations this was an important role. He later moved on to work at The Graphic, where he was also under pressure to work to deadlines. For instance, he completed a two page drawing of the Jubilee Procession outside St. Paul’s in a single day, and a four page drawing of the Battle of Omdurman was completed in two days, both representing very significant tasks which required staying up all night. Dadd began producing black and white works from around 1882. His equestrian and military scenes were considered particularly good. Dadd also worked for a number of magazines, including The Quiver, particularly for boys’ adventure stories. Dadd was elected as a member of the Royal Institute in 1884 and of the Royal Institute of Oil Painters in 1888. His works were exhibited at the Royal Academy occasionally from 1872 onwards, and also at Suffolk Street and the New Watercolour Society. He is also known to have exhibited works at the Franco-British Exhibition, which was held in London in 1908 and also in Philadelphia, Australia and New Zealand. Dadd’s style is very photogenic with heavy application of body colour and clever uses of grey wash. He was technically excellent and very accurate in detail. His pictures have been described as models of Edwardian eloquence. His output was prolific; between 1880 and 1900 he completed an average of one hundred black and white drawings per year, illustrated a number of books and submitted works for exhibitions. Frank Dadd married one Jessie Herbert and had two sons and one daughter. In 1903 they moved to Wallington, Surrey. Dadd renamed the large house Morwenstow and they lived there for sixteen years, with Dadd working from a large studio within the home. Dadd’s reputation was secured in 1908 when one of his paintings, called Gold Lace has a Charm for the Fair, was bought by Chantry Bequest for £100. This painting is now held by the Tate. He continued to be a commercially successful artist and his works commanded high prices. Dadd was an enthusiastic collector of military arms and armour, costume and old furniture, which no doubts accounts for the historical accuracy of his work. He was an outdoor man and enjoyed walking in the countryside with his dogs. Frank and Jessie, who enjoyed a happy marriage, moved to Teignmouth in Devon in 1919, and he continued to paint right up until his sudden death on 7th March 1929. His obituary, in the Teignmouth Post the following day described his work as having “a pleasing freshness and delicately sensitive handling of colour value that delight the eye”. This is a landscape of the Sudan desert, depicting uniformed British army officers as part of a camel train with sand dunes in the background. The British Desert Column were active in the area throughout the late nineteenth century and are associated with Major Charles George Gordon, (also known as Chinese Gordon, Gordon Pasha, and Gordon of Khartoum) who was the Governor-General of Sudan for much of this era.